I have been writing in a journal for almost 10 years now. I remember starting out wondering exactly how to write down my thoughts. I fought back the initial urge to start with “Dear Diary…..”! My first instinct was to write about all the things I was unhappy about (and I think I did) – how I wasn’t where I wanted to be in my life, how I didn’t love my job, how I thought the Universe was plotting against me, and on and on and on. As I began to write more, and perhaps after seeing my sad, raw thoughts written down, I began to slowly transition into writing about the experiences for which I was grateful. Sound too simple? It actually is. 1. Decide on the type of journal book. Does it have an inspirational cover or is it a specific color? Is it blank inside or have lines? Are you better at writing on your computer or ipad? Keep the book/laptop some place in your house where you can see it (I keep my journal book next to my bed with a pen). 2. Commit to a writing schedule. It doesn’t have to be every day and it doesn’t have to elaborate, but having a schedule will keep you motivated and focused on the positive experiences of your day. 3. Include experiences, not just things. Think about how certain moments of your day make you feel. You may feel grateful for having the money to buy a new outfit, but how does putting it on make you feel? Confident, poised, successful? When you’re thankful for your baby’s smile, what feelings does that invoke in you – love, warmth, happiness? 4. Write out 3-5 moments you are thankful for. Either write out a list or write out your day as a story. Often, I will re-read what I’ve written in the past, and it will always bring a smile to my face and shift my focus. 5. Keep it real. Write in a way that is personal and authentic to you. It’s not about making your entries flowery or poetic. Remember, you are not being judged by the style of your writing. Just write your truth. Journaling is a great way to recount your blessings. You will find they are all around you and come in ways you didn’t imagine. Remember to have gratitude for the hard lessons. 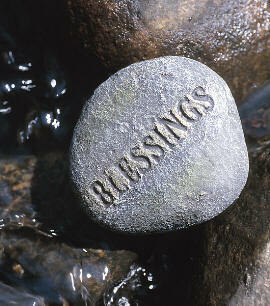 Your rocky times may have blessings written all over them! This entry was posted in Feel Gratitude and tagged feel gratitude, gratefulness, gratitude journal by Wellness Kriya. Bookmark the permalink.